I photographed this bird in a tree at Halstead's Bay, along the Thousand Islands Parkway east of Gananoque, Ontario on January 20, 2013 at about 10:30 am. The wind was gusting out of the west at about 70 km/hr and I don't think he was too keen to fly at the time. He sat there for at least 15 minutes before leaving. He had to weigh in excess of 10-12 lbs. The photo was taken using a Canon 7D and 18-250 mm lens (at 250 mm) at a distance of about 75 feet. Is it a Golden Eagle? Wow, thanks for the picture Mike, I'm not sure whether that is a Golden or an immature Bald, and I'm thinking you might be right, but I bet one of our readers will know for sure! Comments for Is This a Golden Eagle? 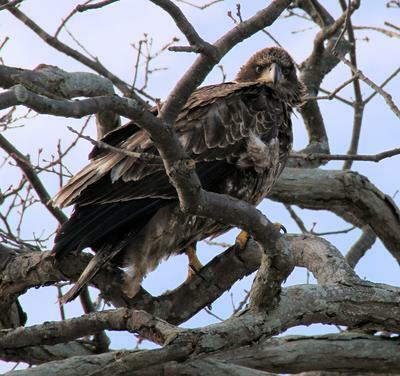 I saw this same Eagle near Georgina Island and a Bald Eagle a minute or two later. I thought it might be a Golden Eagle because it seemed as big or bigger than the adult Bald eagle. That is why I'm searching the web right now to find out if there are Golden Eagles in Gananoque, Ontario. I saw it at end of July 2014. It looks to be a yearling Bald Eagle from the light colouring on his chest area !